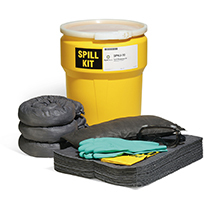 Drum Repair Kit contains components to make small repairs to containers that can leak liquid or bulk hazardous material. Covers cracks, hairline cracks and small holes in any type of low-pressure vessel. Kit features screw and "T" patches, ball and taper surface plugs, epoxy putty, lead wool, barrier tape, wood plugs and all tools and hardware. This advanced Leak Repair Kit employs a quick-application "T" patch and proven ladder patch design to tackle an average forklift-caused puncture. The Kit also contains various plugs and patches for smaller holes and all necessary tools and hardware for effective leak control. Contains a complete set of external pipe bandages as well as extra hard and soft neoprene rubber external pipe bandages for help where you may need it. 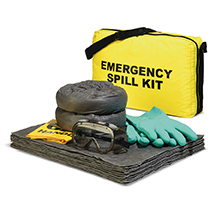 Kit includes all necessary tools and a carrying case for easy handling and usage. Typical applications include water pipes, gas lines, air lines, fuel transfer pipes, chemical transfer lines and sewer pipes. Unlimited uses in municipal departments, chemical plants, manufacturing facilities, hospitals, oil fields, water and sewer treatment plants and anywhere a pipe or line is used. Covers pipe sizes from 5" - 8". Contains a complete set of external pipe bandages as well as extra hard and soft neoprene rubber external pipe bandages for help where you may need it. Kit includes all necessary tools and a carrying case for easy handling and usage. Typical applications include water pipes, gas lines, air lines, fuel transfer pipes, chemical transfer lines and sewer pipes. Unlimited uses in municipal departments, chemical plants, manufacturing facilities, hospitals, oil fields, water and sewer treatment plants and anywhere a pipe or line is used. Covers pipe sizes from 1/2" - 4".